Q: What does my helmet actually protect? 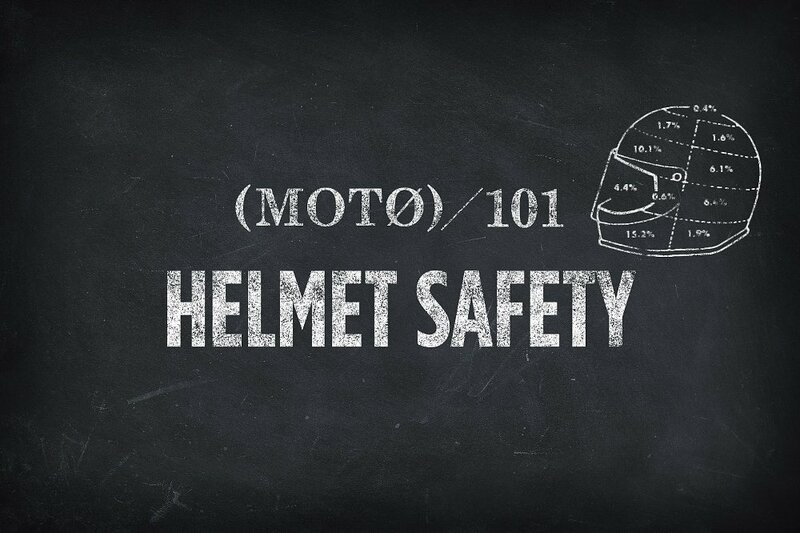 A: Choosing to wear or not wear a helmet is a matter of legal requirements, as well as personal decision-making. I live in Pennsylvania where we do not have a helmet law, but I choose to wear one. If there is no requirement to wear one and you opt to forgo a helmet, no judgment from me. The information to follow is presented for those who are required to wear a helmet or choose to do so. Note the yellow nerves that come down and run like tree roots from the brain and brain stem through the spinal cord. Helmets come in three general flavors: half helmets, three-quarters and full-face (including modulars here, too). 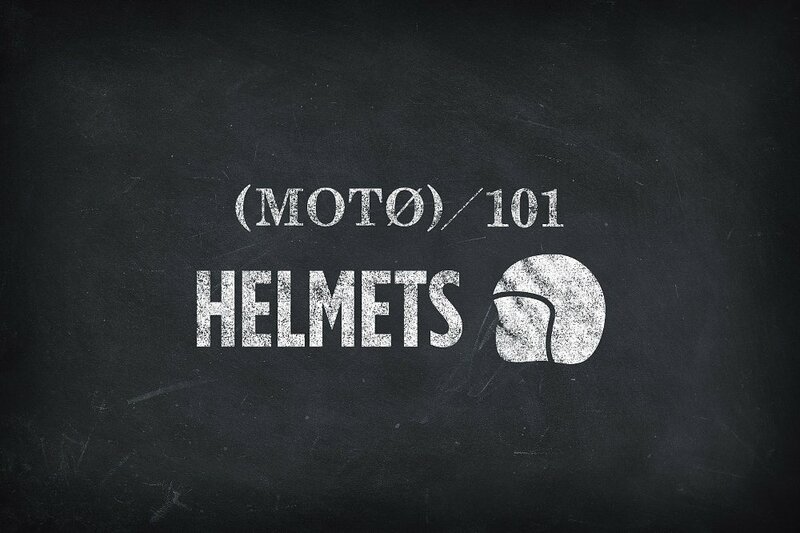 The Moto 101 articles provide introductions to the kinds of helmets, fitment issues and safety ratings. 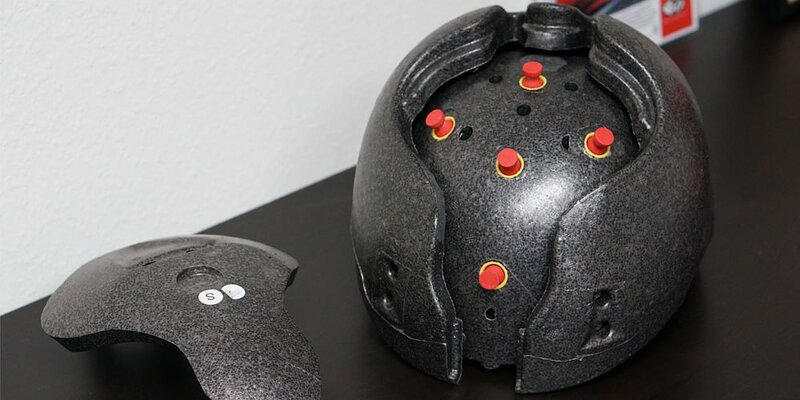 We can assume that helmets purchased with a DOT, Snell or ECE certification (or a combination) meet certain standards in terms of structural integrity and force dissipation. Force dissipation means that when a helmet bangs against something like the ground, that energy is managed by the helmet components to decrease the amount that is transmitted to your scalp, skull, brain and in part, spinal column (bones of your spine) and spinal cord (the soft bundle that transmits nerve impulses). Moreover, a helmet cannot protect what it does not cover; seems simple and obvious but important in decision-making. Your brain has three main parts — the cerebrum, the cerebellum and the brain stem. The cerebrum is the top part of your brain. The uppermost layer (the cerebral cortex) is where all of the nerve cells have their cell bodies, with the rest of the cerebrum composed mostly of extensions from those cell bodies. Specialized groupings along the surface of your brain control different functions, like movement of your head, arms or legs, as well as different parts of your personality, the music lessons from fourth grade, and how you interpret what you see. Your brain in encased in its own “helmet” — your skull. Half-helmets generally cover the top part of your brain (cortex) but not the cerebellum and the brain stem. Functions of the different parts of the brain. Macmillan Cancer Support image, used with permission. The cerebellum is the part of your brain that is essential in balance, while the brain stem is that part that keeps you alive. It is important to understand that the cell bodies in the cortex of both the cerebrum and the cerebellum pass their extensions (neurons or nerves) through the brain stem. Therefore, even very tiny injuries to the brain stem can damage huge areas of the rest of the brain as the nerves are very tightly packed. Think of it like a highway with lots of feeder routes and on ramps that get blocked by an accident that takes out three of the four highway lanes. Injury to your brain stem works a lot like that, except we do not know how to clear the highway and restore normal operation. Three-quarter helmets cover all of these areas but not your face below your forehead. Some have faceplates that snap on or rotate into place. These will at least protect you from bugs and road debris, as well as the cigarette flicked out of the car ahead of you. However, their structural strength in terms of protecting the bony structures of your face are less than what you would have in a full-face helmet. Let's assume that you wear appropriate eye protection. This leaves the soft tissues of your face, as well as your teeth and bones, outside of a protective shell. Well, soft tissue heals and the bones, if broken, are really just a fracture, so what is the big deal? The bones of your face do more than make some of us appropriate for modeling on the runway or for energy drink sponsors. They serve as points of attachment for the muscles of your face that are essential for everything from facial expression, eyelid closing, speaking, chewing, and swallowing (yes, including beer), to name a few. Facial reconstruction is a rapidly evolving art form that uses three-dimensional modeling and even 3D printers, in certain circumstances. A titanium 3D-printed prosthesis was used to reconstruct the face of a Brazilian motorcyclist who suffered a devastating injury in June, 2015. Bones from other locations (such as a rib, or the lower leg such as the tibia) may be used to recreate things like a jawbone. Joints, such as the temporomandibular joint (hinge joint at the top of your jawbone where it connects to your skull), when damaged, are much more difficult to return to normal. Perhaps more importantly, when your face bears the brunt of the impact, a substantial portion of the force is transmitted to your skull and therefore your brain. Full-face and to a somewhat (minimally) lesser extent, modular helmets, distribute this force through the helmet substructure and markedly reduce what gets to your brain. Why are modular helmets less able to dissipate force than full-face helmets, you ask? This is related to the mobile component that rotates about a hinge. When there are two pieces, the force transmission is not as uniform as when there is only a single element. How much different, you want to know? That varies depending on the hinge mechanism, how tight the fit happens to be, and even the hinge material (metal is better than plastic here). Also, few want to volunteer for the experiment. Other things influence the transmitted force, such as the direction of impact, how many impacts occur, and whether there is sliding that diminishes the last impact that leads to you stopping. If you dismount at 55 mph and are launched into a Jersey barrier head-first, there is much more force than if you hit the asphalt, slide for 100 feet and then hit your head into the same barrier. Of course, the full face-helmet will also keep you from tearing off parts of your face during a face-down slide. Most modern helmets feature pull tabs for quick-release cheek pads. This makes it easier for emergency personnel to remove the cheek pads and then the helmet without moving the victim's head or neck. RevZilla photo. The goal here is to not direct you towards one helmet or another, but instead to better inform you of how to assess your own risk-benefit ratio in picking the helmet that is right for your head. None of the helmets do much for your cervical (neck) spine, but that is a topic for another day. Prior concerns that having a full-face helmet would jeopardize your spinal cord, since the helmet was difficult to remove, have been addressed by an emergency-release feature that helps EMS workers safely remove your helmet while keeping your spine aligned. 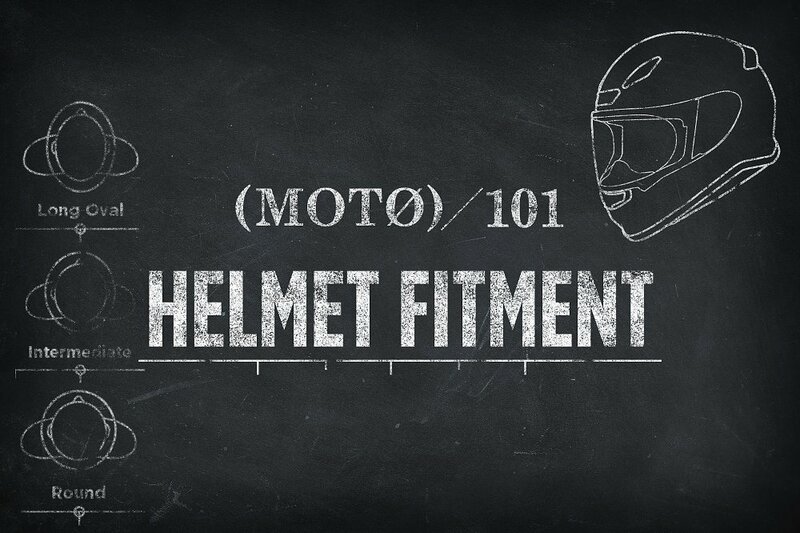 Choose the helmet that fits your needs, your riding style and your personal risk-benefit ratio. If you choose to ride without a helmet, enjoy the breeze — and the bugs — but please, at least wear glasses or goggles with UV blockage and sunscreen!